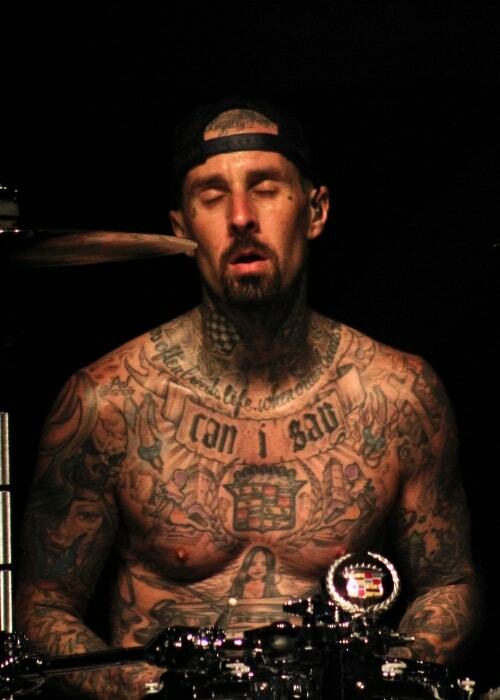 Travis Barker is best known for being the drummer of Blink-182. However, his musical contributions aren’t solely limited to the popular punk rock band as he has also collaborated with several hip-hop artists. He is a member of the rap-rock group Transplants and has served as a founder of the rock bands +44 and Box Car Racer. His status as one of the finest drummers of his generation doesn’t come as a surprise to those who have followed his journey. Travis Barker started his journey at a very young age of 4 with the drum kit gifted by his mother, who later passed away just before Barker started high school. But, while on her deathbed, she urged him to follow his dreams and keep on playing music. Barker lives in a lavish modern-style mansion in Calabasas. The eye-catching features of the home include 10-foot walls of glass, 13-foot ceilings, and a master suite with 3 walk-in closets. Overall, the house has 4 bedrooms and 4 bathrooms. 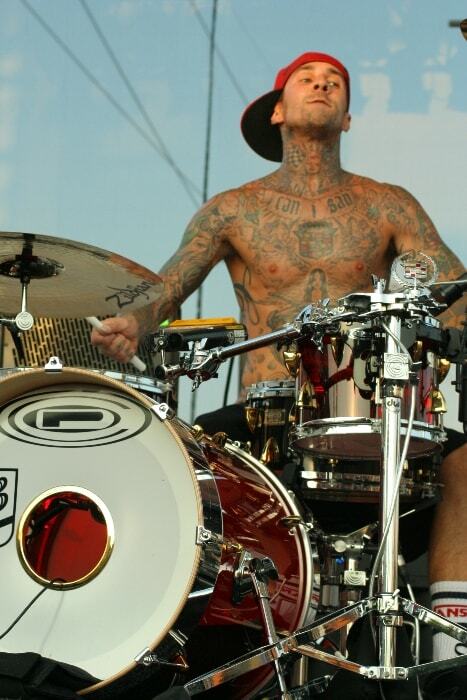 Travis Barker completed his high school education from Fontana High School. Siblings – Shanna Barker (Older Sister). He also has another older sister. Melissa Kennedy (2001-2002) – In 2001, Travis Barker got married to his girlfriend Melissa Kennedy. However, their marriage didn’t last long as they got divorced in August 2002. Shanna Moakler (2002-February 2008, 2009) – Travis Barker has had a very on and off relationship with a beauty queen, Shanna Moakler, who was the winner of Miss USA beauty pageant in 1995. They had first met each other in the summer of 2002 while he was undergoing divorce from Melissa Kennedy. By the start of the following year, Shanna had got pregnant with their first child. She gave birth to their son, Landon Asher Barker, in October 2003. They got engaged in the same month and got married in a Gothic theme wedding in October 2004. She gave birth to their daughter, Alabama Luella Barker, in December 2005. However, in August 2006, Barker decided to file for divorce, which was followed by an online mud-slinging bout between them. They were seen together in December of the same year. In her interview with People magazine in March 2007, she revealed that they had decided to give their relationship another go. However, their divorce was finalized in February 2008. They made another attempt to rekindle their romance in the early months of 2009 but by April it was announced that they had again separated. The police had to be called to their shared LA home in December 2014 after they had got in an altercation, which involved both of them making criminal threats against each other. As a result, they were arrested by police but no charge was filed eventually. Kimberly Stewart (2006) – In 2006, Barker was reported to be dating socialite and reality TV star, Kimberly Stewart. Paris Hilton (2006) – He was linked with popular socialite Paris Hilton in September 2006. It was claimed that they had been spotted partying together on a number of occasions. Plus, it was reported that they had been seen making out in a couple of nightclubs. He would later confirm their dalliance in his memoir by claiming that they did everything over the course of a few weeks. They even had a drunken wedding ceremony which was officiated by rap mogul Suge Knight. Tara Conner (2006) – Towards the end of 2006, it was reported that Barker had a fling with beauty pageant winner and actress, Tara Conner. He would later write very complimentary things about his sexual relationship with Conner. In fact, he claimed that he ended his relationship with Paris Hilton because he was having too much fun with Conner. Lindsay Lohan (2007) – In January 2007, he got close to Lindsay Lohan. They had met at a party and started making out at the same party. However, they couldn’t progress to anything because Shanna Moakler caught wind of it and nipped their relationship in the bud. Tara Reid (2009) – In 2009, Barker was rumored to be going out with actress Tara Reid. Kim Kardashian – In his memoirs, Barker has claimed that he had gone on a few dates with Kim Kardashian. He had met Kim through his then-girlfriend Paris Hilton. At that time, Kim was working as Paris’ assistant. Rihanna (2011) – In the early months of 2011, Barker was linked with singer Rihanna. It was claimed that they had grown close while working together. Arianny Celeste (2015) – In the summer of 2015, it was revealed that Barker had been going out with model Arianny Celeste for several months. They were first seen together in February while attending a UFC fight in Los Angeles. Rita Ora (2015) – At the start of October 2015, Rita Ora confirmed that she was going out with Travis Barker. But, just a couple of weeks later, it was revealed that they had separated as Barker didn’t want to get in a serious relationship. Kourtney Kardashian (2018) – After they were spotted together on a couple of occasions, it was reported that Barker was going out with the reality TV star, Kourtney Kardashian. He has English ancestry on his father’s side. 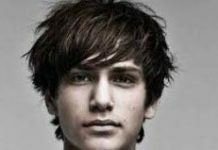 While on his mother’s side, he is of Irish and Italian descent. Travis Barker has appeared in a TV commercial for Boost Mobile. He was raised in a Catholic household. He regularly visits the church and prays with his children. Furthermore, he has got religious tattoos such as the Holy Cross, Jesus Christ, and Virgin Mary inked on his body. Being the drummer of the rock band, Blink-182. 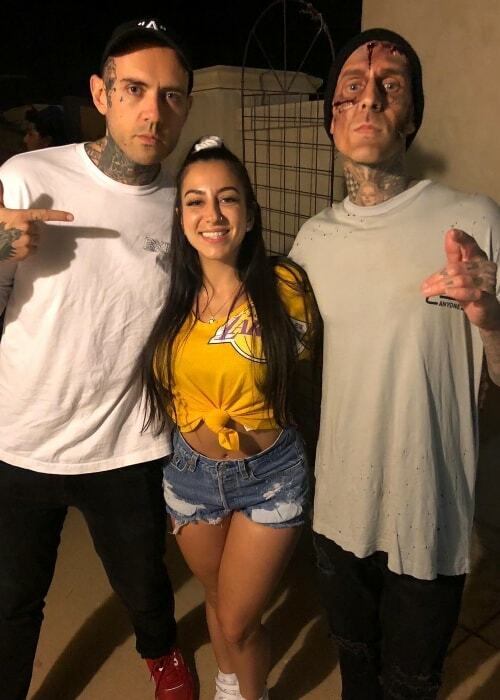 The band is best known for its contribution to the development of pop punk music genre and has also earned a lot of commercial success and has sold over 50 million records all over the world. 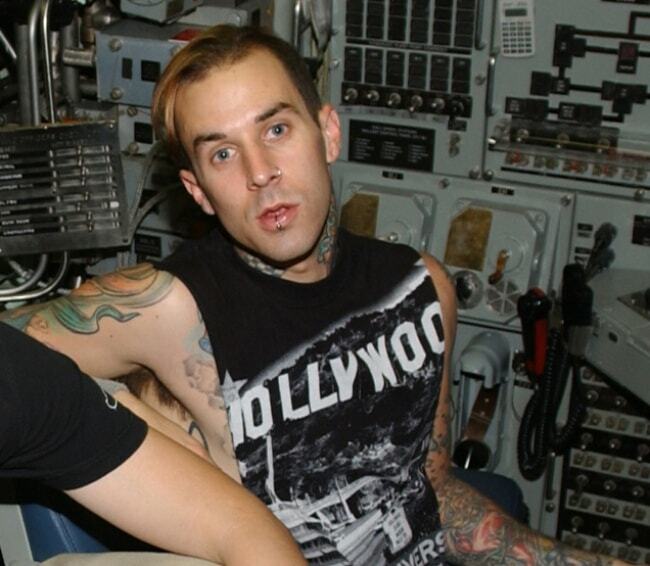 His first studio album with Blink-182 was Enema of the State, which was released in June 1999. The album was an enormous success and went on to sell over 15 million copies worldwide and announced band’s arrival on the global stage. In March 2011, he released his debut solo album, Give the Drummer Some. The album was a decent success and debuted in the 9th spot on Billboard 200 chart. It sold over 28k copies within the first week. In 1999, he made his theatrical film debut in the popular comedy movie, American Pie. However, his appearance in the movie got miscredited as his part was credited to Blink-182‘s former drummer, Scott Raynor. As a voice artist, his first credited theatrical film work came in the animated comedy movie, Live Freaky Die Freaky, which was released in 2006. In 1992, Travis Barker made his first TV show appearance in the comedy series, The Big Breakfast. Travis Barker has hired Don Brooks as his personal trainer in a bid to keep himself in top shape for the grueling demands of regular touring. Brooks has focussed on boosting Barker’s stamina. He has devised a sort of tempo training routine for Barker. The tempo or speed of the workout is synced to a metronome or some other kind of music. For the strength training, Barker usually relies on a series of bodyweight exercises such as push-ups, dips, and pull-ups. These exercises are either performed in supersets or a circuit. He changes the workout routine almost daily. However, the intensity is always kept up. He has also made boxing an integral component of his fitness regime. He hits the boxing rink a few times a week. He usually trains under the guidance of Glenn Holmes at his gym in Los Angeles. When he is on road, he sustains his fitness regime by performing bodyweight exercises in the hotel room. He also carries the battle ropes along and has it set up somewhere. He also likes to sneak out for a run when he has some free time on his hands. He fuels his body with a strict vegan diet. When he is on the road, he makes it a point to find a good vegan restaurant in the town. To keep hunger in between the meals at bay, he snacks on blueberries, acai berries, and strawberries. He also brings a juicer along and makes healthy juices. His mother gave him his first drum kit when he was 4 years old. He would play the same kit until he turned 15. At the age of 5, he started taking drum lessons from a drummer named Michael Mai. Michael exposed Barker to various playing styles. He started taking piano lessons while he was studying in junior high. He also tried his hand at singing and joined the madrigals men and women’s choir. While growing up, he briefly harbored aspirations of becoming a professional surfer. He also thought about becoming a skateboarder but always returned back to his drums. 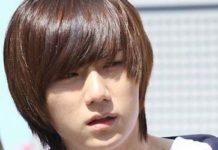 He is a part-owner of the Crossroads Restaurant, which is located in Melrose Avenue in Los Angeles. He is a huge fan of Cadillacs and loves to collect the iconic American car. He also has an extensive collection of old bikes. After graduating from high school, he started working as a trash man in Laguna Beach. He was also playing music with the punk rock bands Snot and Feeble. It was while working with Feeble that he met bass guitarist Chad Larson who would later co-found ska punk group, Aquabats. The band used Larson to recruit Barker as a fill-in for a few days but later decided to make him a member of the band. After the release of his first album with Aquabats (The Fury of the Aquabats! ), the group was roped in to tour with Blink-182. After Scott Raynor, the original drummer of Blink-182 announced that he was leaving the band, Barker was brought as a fill-in. Barker didn’t have enough time to practice with the band before their show and managed to perform flawlessly despite practicing for just 45 minutes. Raynor eventually returned back to the band but he started having frequent arguments with fellow members. He was eventually fired as his bandmates had got fed-up with his drinking problem. In 1999, he started his clothing brand under the label of Famous Star & Straps. The design of the merchandise is heavily influenced by Barker’s love for body art. He is such a big fan of tattoos that he has got his entire scalp tattooed. He has also got a picture of the Virgin Mary inked on his head. In 2004, he established his record label called LaSalle Records. He later signed a distribution deal with Atlantic Records. He has collaborated with DC Shoes to launch his collection of shoes. He has also partnered with Zildjian cymbals to create his exclusive collection of music merchandise. In 2015, he published his autobiography Can I Say: Living Large, Cheating Death, and Drums, Drums, Drums, in which he opened up about his struggles. The esteemed Rolling Stone has included him in their list featuring ‘100 Greatest Drummers of All Time’. The magazine also declared him punk’s first superstar drummer. In September 2008, Travis was involved in a horrific accident after the tire of his private plane blew off and the plane crashed into an embankment while aborting the take-off. He and disc jockey Adam “DJ AM” Goldstein were the only survivors. As a result of the crash, he suffered severe burns and had to spend 11 weeks in burn centers and hospitals, during which he underwent 16 surgeries and several skin graft procedures. Upon making full recovery from his injuries, he decided to file a lawsuit against plane’s owners, Goodyear Tire and Rubber Co., and an airplane maintenance company. The lawsuit was eventually settled out of court and the terms of the settlement were kept confidential. Visit his official website @ travisbarker.com. Follow Travis Barker on Facebook, Twitter, Instagram, SoundCloud, and YouTube.